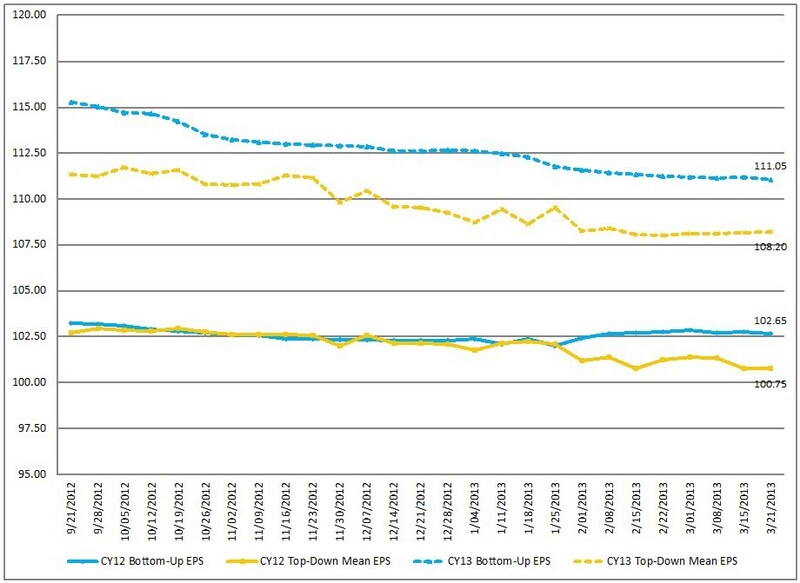 Below are three long-term charts, from Doug Short’s blog post of March 29 titled “ECRI’s ‘Recession’ Indicator: Unchanged from Last Week.” These charts are on a weekly basis through the March 29 release, indicating data through March 22, 2013. 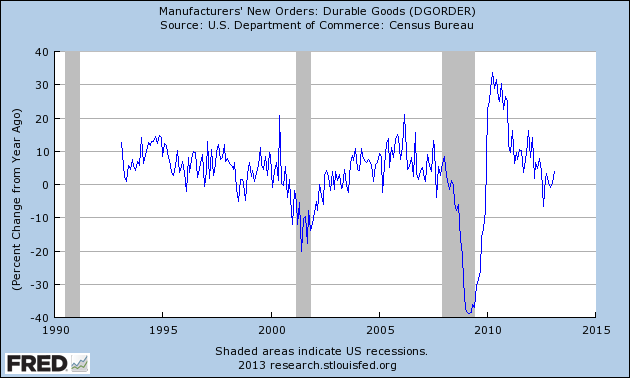 This entry was posted in Economic Forecasts and tagged ECRI on March 30, 2013 by Ted Kavadas. This entry was posted in Economic Forecasts and tagged Economic Forecasts, economic indicators, STLFSI on March 30, 2013 by Ted Kavadas. 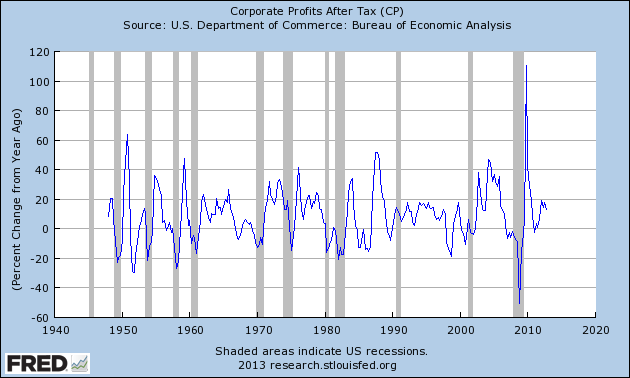 In the last post (“4th Quarter Corporate Profits“) I displayed, for reference purposes, a long-term chart depicting Corporate Profits After Tax. 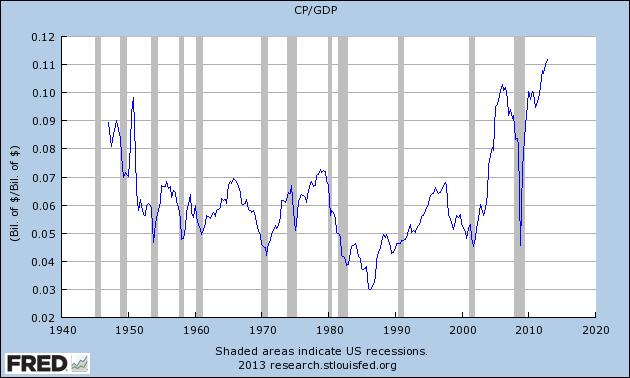 As one can see from the long-term chart below (updated through the fourth quarter), (After Tax) Corporate Profits as a Percentage of GDP is at levels that can be seen as historically (very) high. 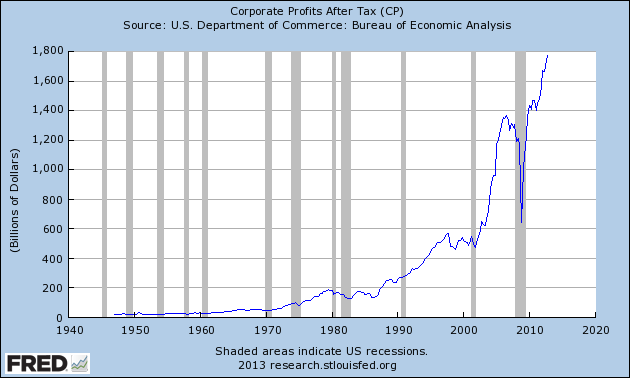 While there are many reasons as to why this is so, from a going-forward standpoint I think it is important to recognize both that such a notable condition exists, as well as contemplate and/or plan for such factors and conditions that would come about if (and in my opinion “when”) a more historically “normal” ratio of Corporate Profits as a Percentage of GDP occurs. This topic can be very complex in nature, and depends upon myriad factors. In my opinion it deserves far greater recognition. This entry was posted in Business and tagged Business on March 28, 2013 by Ted Kavadas. Today’s GDP release (Q4, 3rd Estimate) was accompanied by the BLS Corporate Profits report for the 4th quarter and full year. Recently Deloitte released their “CFO Signals” “High-Level Summary” report for the 1st Quarter of 2013. What are companies’ business focus areas for the next year? Most companies are focused more on pursuing opportunity than on limiting risk, and much more on growing and scaling than on contracting and rationalizing. In step with optimism, sales and earnings growth expectations have improved, but are still not strong by historical standards. Sales expectations are essentially unchanged at 5.4%*, above the survey-low 4.8%* in 3Q12, but also well below the 7% long-term average. 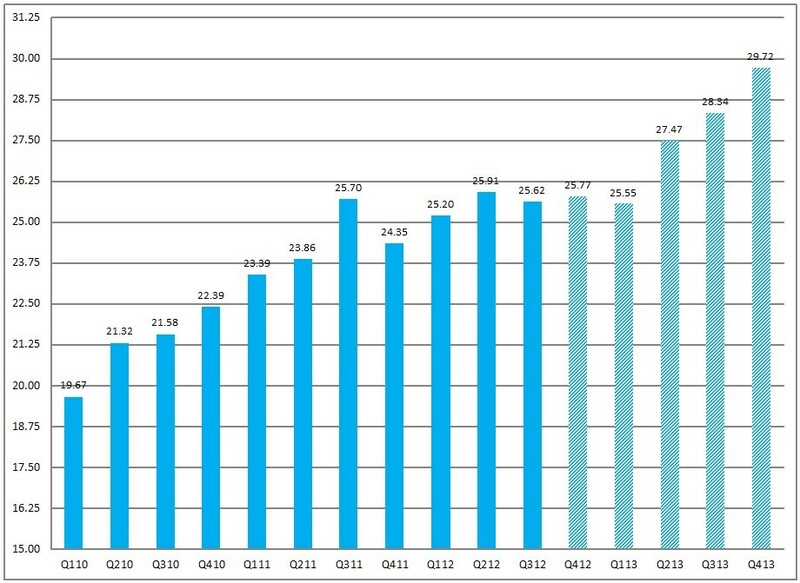 Similarly, expected earnings growth rose from 10.9%* to 12.1%*, but this is still comparatively low. Domestic hiring is expected to rise 0.9% overall, consistent with last quarter’s 1.0% and above the 3Q12 survey low of 0.6%; the median is again 0%, with 43% of CFOs expecting year-over-year gains, and 27% expecting cuts (essentially even with the survey high from last quarter). About 50% of CFOs expressed rising optimism, and just under 20% expressed rising pessimism — a major turn of events from last quarter. Optimism in the U.S. rebounded strongly — with net optimism rising from -16 two quarters ago and -21 last quarter to +33 this quarter. 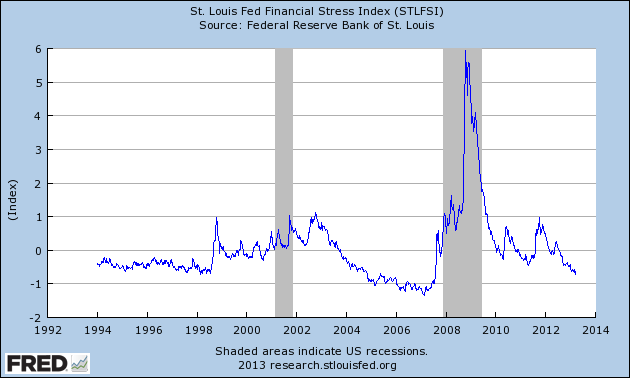 Economic concerns have largely transitioned from worries about crises/collapse to worries about persistent stagnation. In the August 9, 2011 post (“QE3 – Various Thoughts“) I posted a chart that depicted the movements of the S&P500, 10-Year Treasury Yield and the Fed Funds rate spanning the periods of various Federal Reserve interventions since 2007. This entry was posted in Uncategorized and tagged Markets During Intervention on March 27, 2013 by Ted Kavadas. 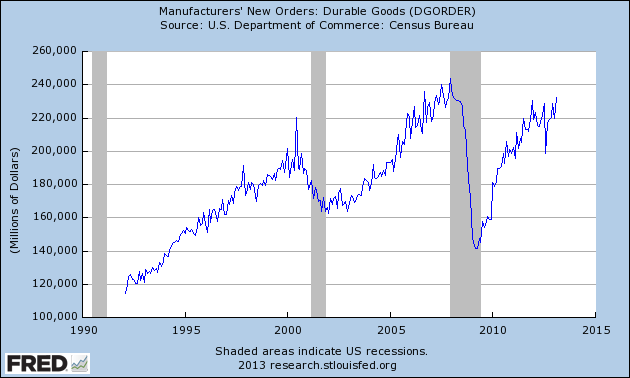 This entry was posted in Uncategorized and tagged Consumer Confidence on March 27, 2013 by Ted Kavadas. 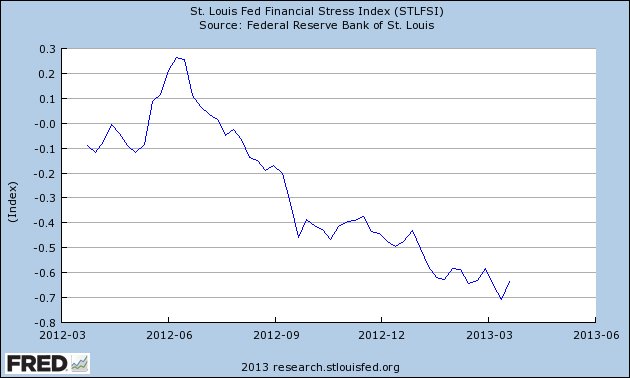 This entry was posted in Uncategorized and tagged economic indicators on March 27, 2013 by Ted Kavadas. This entry was posted in Investor, Stock Market and tagged S&P500, S&P500 Earnings, Stock Market on March 26, 2013 by Ted Kavadas.